A Queen's-led team has discovered the reason why garlic is so good for us. 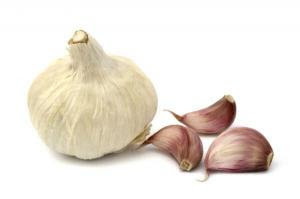 Researchers have widely believed that the organic compound, allicin – which gives garlic its aroma and flavour – acts as the world's most powerful antioxidant. But until now it hasn't been clear how allicin works, or how it stacks up compared to more common antioxidants such as Vitamin E and coenzyme Q10, which stop the damaging effects of radicals. "We didn't understand how garlic could contain such an efficient antioxidant, since it didn't have a substantial amount of the types of compounds usually responsible for high antioxidant activity in plants, such as the flavanoids found in green tea or grapes," says Chemistry professor Derek Pratt, who led the study. "If allicin was indeed responsible for this activity in garlic, we wanted to find out how it worked." The research team questioned the ability of allicin to trap damaging radicals so effectively, and considered the possibility that a decomposition product of allicin may instead be responsible. Through experiments with synthetically-produced allicin, they found that an acid produced when the compound decomposes rapidly reacts with radicals. Their findings are published in the January 2009 issue of the international chemistry journal Angewandte Chemie. "Basically the allicin compound has to decompose in order to generate a potent antioxidant," explains Dr. Pratt, who is Canada Research Chair in Free Radical Chemistry. "The reaction between the sulfenic acid and radicals is as fast as it can get, limited only by the time it takes for the two molecules to come into contact. No one has ever seen compounds, natural or synthetic, react this quickly as antioxidants." The researcher is confident that a link exists between the reactivity of the sulfenic acid and the medicinal benefits of garlic. "While garlic has been used as a herbal medicine for centuries and there are many garlic supplements on the market, until now there has been no convincing explanation as to why garlic is beneficial," says Dr. Pratt. "I think we have taken the first step in uncovering a fundamental chemical mechanism which may explain garlic's medicinal benefits." Along with onions, leeks and shallots, garlic is a species in the family Alliaceae. All of these other plants contain a compound that is very similar to allicin, but they do not have the same medicinal properties. Dr. Pratt and his colleagues believe that this is due to a slower rate of decomposition of the allicin analogs in the onions, leaks and shallots, which leads to a lower level of sulfenic acid available to react as antioxidants with radicals. The study was funded by the Natural Sciences and Engineering Research Council of Canada (NSERC) and the Ontario Ministry of Innovation. Other members of the research team are Queen's Chemistry post-doctoral researcher Vipraja Vaidya and Keith Ingold, from the National Research Council of Canada.